Manchester City midfielder David Silva has announced his retirement from international football after Spain’s disappointing World Cup last-16 exit. He enjoyed a stellar 12-year career for Spain, winning 125 caps along the way. However, he is undoubtedly one of the most underrated players in recent years. 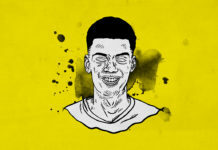 Largely hidden by the trio of Xavi-Iniesta-Busquet in Spain national team, he was still a full member of the Spanish squad that triumphed at the 2010 World Cup in South Africa and achieved a superb double by winning the Euro in 2008 and 2012, with eleven starts during these three competitions. 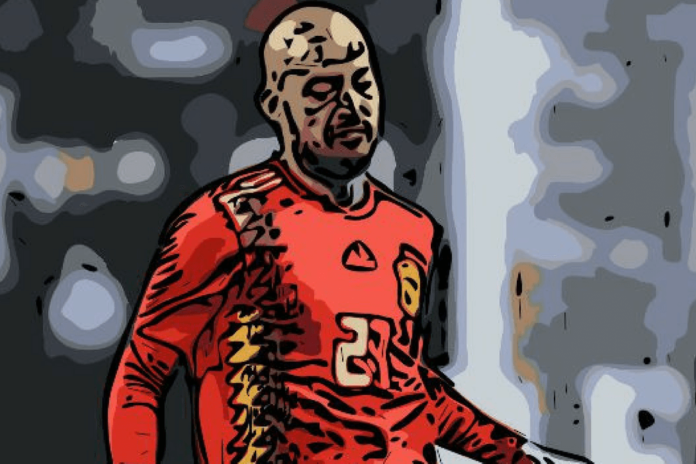 Here we will take a look at David Silva career, how he has tactically matured over the last few seasons and how this decision could elongate his career. Though is started his Valencia career in 2004, he really stood out in the 2009-2010 season. David Silva scores a personal best of eight league goals and overall makes his best season with Valencia CF as the club finishes the season in third place in the league and qualifies for the Champions League. On April 15, 2010, he scored a superb goal against Athletic Bilbao as his team won 2-0, before making three assists in the sixteenth final of the Europa League against Werder Bremen. Alongside David Villa, Jordi Alba, Ever Banega, Juan Mata or Carlos Marchena, David Silva was part of this golden generation that did not play in Barcelona or Real Madrid at the time. 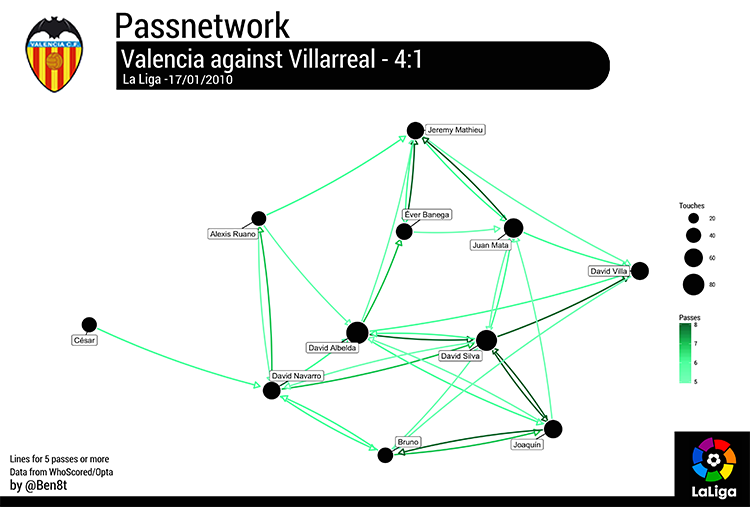 As we can see in the passnetwork below, he played most of the time in the “10 position” in a 4-2-3-1 scheme either as a playmaker or as a striker support. In this 2009-2010 season, he scored 8 goals and provided 7 assists in 30 games. 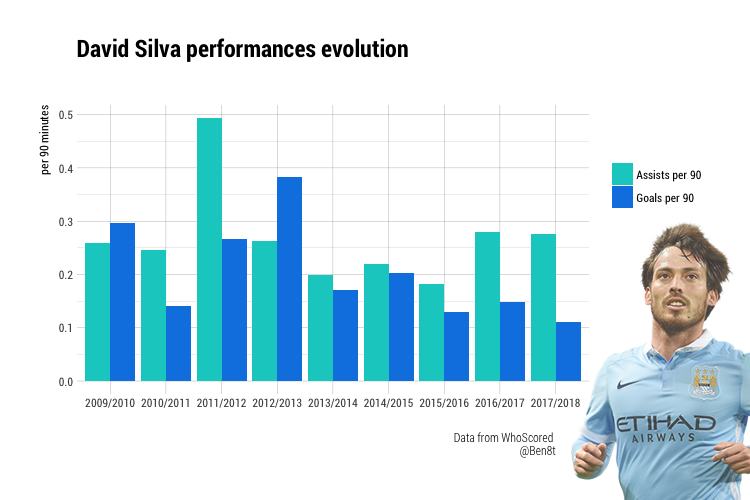 During Mancini and Pellegrini seasons in Manchester City – 2010 up to 2016 – the Spanish player was positioned a lot on the right wing which was an evolution from his time in Valencia. In the Spain national team, he also played in such a position while the midfield was “blocked” by Xavi-Iniesta-Busquet trio. This position also fits him perfectly. While he is left footed, he can build the game by coming in the centre of the field or provide breaking crosses by putting himself on his left foot, like Eriksen or Ozil nowadays. But unlike the latter, he also scores a lot of goals for his kind of profile. He is not fast and doesn’t have a incredible stamina but he has a rare intelligence in his moves which does more than compensate these gaps. Therefore he is not always on the wing and he plays a lot behind the striker, like his time in Valencia. We see the influence of Guardiola: he score as many goals as before, but he provides much more assists. In Guardiola lineups, David Silva plays more on the left side of the midfield. David Silva is left-footed, De Bruyne right footed and so it’s perfect to play possession from the wing to the centre of the field. In Guardiola gameplans, these two midfielders tend to pass in diagonals and so shaping “triangles” in the build-up, a mark of Guardiola’s game. In defence, he is a key in Manchester City’s balance thanks to his intelligence of moves which allows covering gaps when the left back goes on ahead. What about international retirement and end of career? 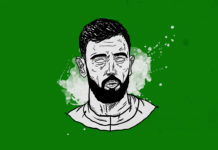 One of the main reason for players to announce their international retirement is that the players need time to recover during a tough season and for some, it is best to stop rather than go into another competition of significance. International play is competitive and to earn the position one has to show up and work probably harder than they want to or care to. Italian legend Paolo Maldini announced his retirement as an Azzurri after the debacle of the 2002 World Cup earning 126 caps for Italy, then a national record. The Milan legend was 34, but given that he continued to play at the top level for his club for another seven years, he definitely had it in him to carry on for longer. 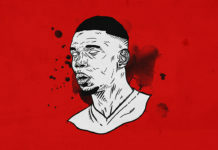 Similarly, there are others like Francesco Totti (2007) and Paul Scholes (2004) whom both retired at the very early age of 30, wanting to concentrate on their club careers having represented their countries for a total of 58 and 66 times respectively. It’s fair to say, both played some of their best football post-retirement as Totti went on to be crowned the Capocannoniere – Serie A’s top scorer – with 26 goals in 35 league appearances in 2006-07 while Scholes went on to lift the Champions League in the 2007-08 season with Manchester United. For David Silva the choice could be perfect: he is 32 years old and the next Euro is in 2020. There are Isco and Ascensio in Spain who are younger and almost at the same level and so it would be difficult to keep a place in this team. Guardiola could make him a deeper playmaker, a bit like Fabregas in Chelsea. Players are rare in this role and he should be perfect for a position requiring fewer efforts. Therefore he could continue his career in Manchester for three years and why not going to the United States where Manchester City’s franchise New York City will be a perfect place for him.